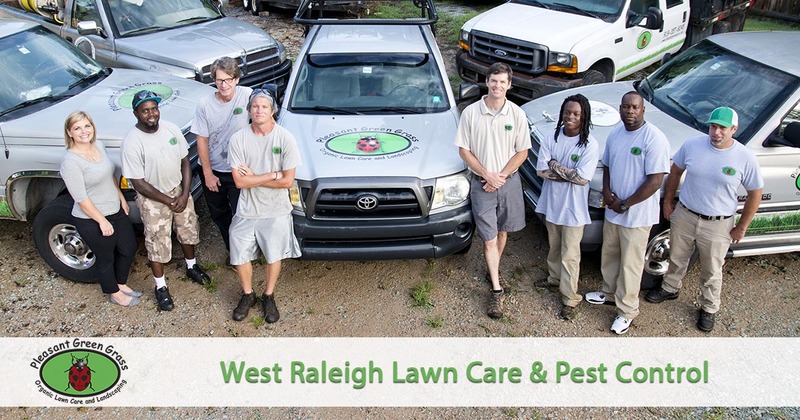 If you are looking for effective lawn care and pest control services in the West Raleigh, NC area that are safe for your family and pets, then look no further. Pleasant Green Grass offers organic lawn fertilization and pest control services that are safe for your family and pets. Living in West Raleigh, NC, is an ideal choice for downtown living and college campus needs. But what about residents who live here all year? While living in the city reduces the need for monthly maintenance services, what about homes that still have yards? You need one company to handle all your lawn care needs. Pleasant Green Grass remains the top name in local yard care solutions. We continue to emphasize a greener approach to landscaping and outdoor pest control for healthier lawns. Whatever your backyard needs to look its best, we have a completely organic method for you. Call today for your best yards! Why should your lawn care leave your plants covered in sticky poisons? While these products may initially scare of weeds, they may wind up damaging the soil underneath. Instead, our team takes a more natural approach to keeping your yards green. We offer better lawn care, weed control, core aeration, and fertilization that gets results! Stop depending on toxic sprays to force your yard to grow. Instead, give it the care and attention it deserves with us! If it crawls, flies, or bites, it’s likely already living in your yard. We have a variety of different pests in our state that all love to live in lawns. We offer organic yard pest control solutions that fight off all manner of bugs. Whether you have a problem with spiders and ticks, mosquitos and fleas, or even grubs eating all your plants, we have the natural application for you. Call our team now to get rid of yard pests the safe way. We only target the invasive bugs, leaving your plants safe and healthy! The organic lawn fertilization and pest control services we offer in West Raleigh, NC are healthier, safer, and more effective than traditional chemical applications that are harmful to people, pets and the environment. Give us a call today and experience the difference in working with a company that cares as much about the safety of the products we use as we do for our customers.